Note: Devotion taken from last Sunday's sermon on John 11:17-34. John 11:25 Jesus said unto her, I am the resurrection, and the life: he that believeth in me, though he were dead, yet shall he live: 26 And whosoever liveth and believeth in me shall never die. Believest thou this? This is an outlandish statement for any mere man to make: I am the resurrection. Christ here claims that he is the power that will raise the dead from their graves and that will unite their bodies with their souls and assign them to heaven or hell for eternity, based on how they have responded to him. He also says, I am the life. He is the power that gives both physical and spiritual life to men. He gives the abundant life (10:10b) and eternal life (10:27-28). If this not true, then this is the height of arrogance and delusion. Yet it is true. He then gives a promise to believers: “he that believeth in me, though he were dead, yet shall he live” (v. 25b). This is one of my favorite passages to read at the funeral service of a believer. It is a precious promise from the Lord. Belief (foundational trust in Christ for all things) plus death equals life. This formula works in the here and now: Belief plus the death of oneself to the world equals the abundant life. If anyone loses his life, he shall find it. And it works in the age to come: Belief plus the experience of physical death (the first death) equals eternal life. How have so many believing martyrs gone to their deaths so cheerfully? They knew that for a believer to close his eyes in death in this world is to awake to eternal life in the world that is to come. Jesus adds: “And whosoever liveth and believeth in me shall never die” (v. 26a). What does it mean to live in Christ? It is to abide in him, to remain in him. It is to have him at the center of everything you do, for him to be the fulcrum upon which everything turns, the center around which everything revolves. And this begins when one believes in him, by grace (Paul will call this justification by faith). What of the promise that such persons do not die? Lazarus has just died and he was one whom Christ loved (see v. 3). Surely then Christ is not speaking about physical death. Christians die. Sometimes they even suffer in death. We are not exempt from this. The death that the believer never experiences, howewer, is “the second death” (Rev 21:8), spiritual death, eternal torment. Jesus then asks Martha: Believest thou this? (v. 26b). This is the question that the Lord Jesus asks of every man. You know the claims that I make about myself. You know that I promise life abundant and eternal to those who believe in me. Do you believe it? 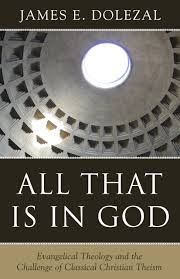 I have recorded and uploaded WM 96: Review: James E. Dolezal, All That Is in God (listen here). In this episode I read through a draft of my review of this important recent work defending a classical, orthodox view of God against some recent innovations ("theistic mutualism") that have arisen even among some evangelical and Calvinistic men. I could not resist drawing a parallel between Enlightenment influenced departures from classical theism and similar modern reconstruals of the doctrine of Scripture. You can also watch and listen to Dolezal's 2015 lectures on this topic on youtube.com (start here). Benjamin Keach on the religious education of children: "you can bend a twig sooner than a great arm of a tree"
Consider the advantages of early age; religion now is most likely to make the deepest impression, and holy habits to be sooner acquired….that ground that hath long lain barren or unploughed, is hard to be broken up, or it [is] not so easy to manure. A plant set but the last year, is sooner plucked up than an old tree; a colt is sooner broke than if you let him run wild til he become an old horse; you can bend a twig sooner than a great arm of a tree: also we put our children to learn any art or mystery when young, because youth can learn sooner than elder persons. And may not all these things convince you, that this is the best time to learn the mysteries of religion and godliness? (p. 139). Note: Devotion taken from last Sunday's sermon on John 11:1-16. Then said Thomas, which is called Didymus, unto his fellowdisciples, Let us also go, that we may die with him (John 11:16). Thomas makes this declaration upon Jesus’s announcement that he plans to go to Bethany after Lazarus had died: “nevertheless let us go unto him” (v. 15). The disciples had earlier registered their concerns about the dangers of such a journey: “Master, the Jews of late sought to stone thee; and goest thou thither again?” (v. 8). Now Thomas tells his fellowdisciples, “Let us go also, that we may die with him.” He recognized that this journey to Bethany might well mean not only the death of Christ but of his followers also. There is something praiseworthy about Thomas’ words. He and the other disciples did go back with Jesus toward Jerusalem. There is something spiritually right about this. To follow Jesus one must be willing to lay down his life (cf. Luke 9:23-24; see esp. v. 24: “For whosoever will save his life shall lose it: but whosoever will lose his life for my sake, the same shall save it.”). Still, we know that there is also something gravely disappointing about it. Though Thomas promises loyalty to the death, he, and the other disciples, will all eventually desert the Lord Jesus when he goes to the cross. The shepherd will be struck and the sheep scattered (Matthew 26:31). Of course, he is best known as “Doubting Thomas,” because he will not believe that Christ has been raised from the dead: “Except I shall see in his hands the print of the nails…. I will not believe” (John 20:25). Finally, by God’s grace, however, he become “Confessing Thomas” when he meets the risen Lord and confesses, “My Lord and my God” (John 20:28). There is something in the fickleness of Thomas and the other disciples with which every disciple can relate. Like Thomas we are sometimes, courageous, fearful, and doubting. But, by God’s grace, we are also confessing disciples, trusting the Lord to keep us in the faith. Image: CRBC kids lined up for Vacation Bible School (VBS). Image: Bible verses and Elijah picture. Note: Devotion taken from last Sunday's sermon on John 10:31-42. The Jews answered him, saying, For a good work we stone thee not; but for blasphemy; and because that thou, being a man, makest thyself God (John 10:33). This seems to stem, in particular, most directly, from his immediate words in v. 30 (“I and my Father are one”), but, no doubt, it also comes from all that he has said before (including the “I am” sayings, in particular). We might say that these opponents have properly understood what Jesus was saying about himself. They rightly understood that he was making a claim about his identity as the Son of God that makes him equal in essence, power, and glory with God the Father and God the Holy Spirit. At the root here is the doctrine that will be acknowledged in later centuries in the orthodox creeds that speak of the one person of Christ being very God and very man. This passage creates insurmountable problems for the Arians and Unitarians who suggest that the Lord Jesus was subordinate with the Father and did not claim equality with him. The charge against Christ was that he was making himself to be God! Leviticus 24:16 And he that blasphemeth the name of the Lord, he shall surely be put to death, and all the congregation shall certainly stone him: as well the stranger, as he that is born in the land, when he blasphemeth the name of the Lord, shall be put to death. But the followers of Jesus have always seen his claims not to be blasphemy but perfectly fitting and true. 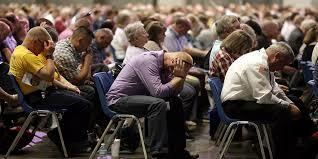 Image: Prayer at the SBC meeting in 2016. I recorded and uploaded WM 95 yesterday (listen here). This episode is a conversation with Pastor Steve Clevenger of Covenant RBC in Warrenton, VA. We discuss recent tumult in the Southern Baptist Convention (SBC) and in broader evangelicalism from the perspective of being former Southern Baptists. In this episode I make reference to this video showing a 1993 Q & A with then newly elected SBTS seminary President Albert Mohler and to a series of youtube videos from the tumultuous 1985 SBC convention in Dallas, TX (begin here). Herman J. Selderhuis, John Calvin: A Pilgrim’s Life (IVP, 2009): 287 pp. I just finished reading this popular level biography of Calvin by the respected Dutch church historian Herman J. Selderhuis. A Presbyterian pastor friend gave a copy to me earlier this year. I met Selderhuis back in 2016 when he was one of the plenary speakers at the Houston Baptist University’s Erasmus conference (I recorded and uploaded one of his conference addresses here). He also attended the breakout session at the same conference in which I presented my paper on “John Calvin and Text Criticism” (audio here) and offered some encouraging feedback. This is an engaging and very readable book, chocked full of interesting anecdotes and insights on Calvin, including ones that are both well-known and lesser known, drawn from Calvin’s letters, sermons, and papers. This is a not a hagiographic work. Selderhuis does not present Cavin as a cardboard cutout Protestant saint. On the other hand, the author is clearly sympathetic to his subject and keen to defend Calvin’s legacy from popular myths and historical misconceptions (e.g., notions that Calvin was a heartless stoic, that he reveled in the death of Servetus, etc.). “Servetus’ defamations of Calvin were like ‘the barking of a dog at a pile of manure’….” (p. 33). “When a Reformed child sits in a church, there is nothing to do but listen or read because there is nothing to look at, and at home it is barely any different” (p. 41). On Calvin’s expansion of his Institutes over time: “Just as with children, the book kept its name and main characteristics, but in growing up it gained experience, size, and weight” (p. 45). “Calvin suffered from an inability to accept that not everyone was as enthusiastic as he was” (p. 145). “He was like a scholar who dealt best with people when he did not see them” (p. 165). “That he did not much care for women can almost be seen in his appearance” (p. 167). On limitations placed on social interactions for courting couples in Calvin’s Geneva: “In short, there was little for couples to do except read the Institutes together” (p. 181). “Seeing himself as an Old Testament prophet, he stood in confidence and pulled no punches” (p. 202). “Servetus was burned, but the smell of smoke has clung to Calvin’s clothes for centuries” (p. 205). “Calvin was not made of stone, and if there are Reformed Christians who are, they are not Calvinists” (p. 254). The overarching theme of the book is reflected in the subtitle. Selderhuis holds that Calvin saw himself as a pilgrim in this life. He had fled his beloved France to live and minister in Geneva. More importantly, as a believer, he was the kind of “alien” and “stranger” in this life described in 1 Peter and Hebrews. 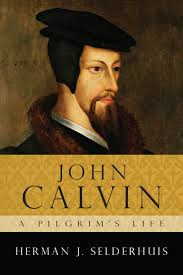 So, Selderhuis observes: “Calvin was a stranger who felt at home only where the gospel could make its home” (p. 251). The closing sentence of the main body of the work is also interesting. The friend who gave me the book had cited it once while we had a discussion on assurance of salvation, and this had prompted the gift. After discussing Calvin’s anticipation of heaven, Selderhuis closes with an observation that reflects some strains of high Dutch Calvinism regarding assurance, “If I am to end up there myself, there are some things that I would like to talk to him [Calvin] about” (p. 259). The book is excellent and commended to all. Tolle lege! Note: Devotion taken from last Sunday's sermon on John 10:22-30. My sheep hear my voice, and I know them, and they follow me (John 10:27). Second, he knows them. The shepherd has an intimate knowledge of his sheep. False professors hear Christ say to them in the end, “I never knew you: depart from me, ye that work iniquity” (Matt 7:23). 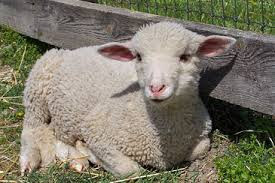 Christ has known his sheep from eternity past: “those whom he did foreknow he did predestinate to be conformed to the image of his Son, that he might be the firstborn among many brethren” (Romans 8:29). Third, they follow him. 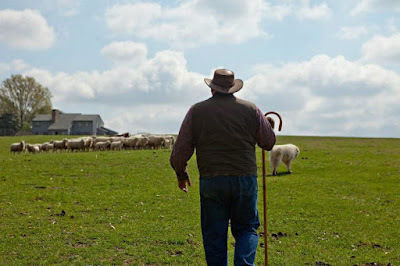 Compare 10:4: “and the sheep follow him.” Following is the language of discipleship (cf. Luke 9:23). This is basic Christian language. It is not enough simply to say that one is a Christian. This will be shown in how one follows the Shepherd. Note: Devotion taken from last Sunday's sermon on John 10:16-21. And other sheep I have, which are not of this fold: them also I must bring, and they shall hear my voice: and there shall be one fold, and one shepherd (John 10:16). First, he describes the necessity of their salvation: “them also I must bring.” The particle dei is used here. It conveys a sense of necessity or compulsion. It is not just possible that these other sheep will be brought in by the shepherd. It is necessary. It is inevitable. Christ is compelled to bring them into his flock. What confidence this should supply to us in our evangelism! We should never be morose or discouraged. Christ must bring in all who are his. Second, he describes their recognition of him: “and they shall hear my voice.” This demolishes any notion of “anonymous” salvation. How will they hear the voice of Christ after his ascension? In the faithful reading and preaching of his word. They will receive the external call and the internal, effectual call of God. And they will recognize the voice of their Shepherd. Third, he describes the unity of his sheep: “and there shall be one fold, and one shepherd.” Notice the “and” is in italic in the KJV, as a word supplied by the translators. In the original Greek there is a striking play on words: mia poimne [one fold or flock], eis poimen [one shepherd]. In English we might approximate this by translating: “one pasture, one Pastor.” We are the flock in his pasture, and Christ is our Pastor-Shepherd. The source of our unity is not that we are all the same but that we follow the same Shepherd.